Earlier this week I wrote about a difficult decision that I made recently. 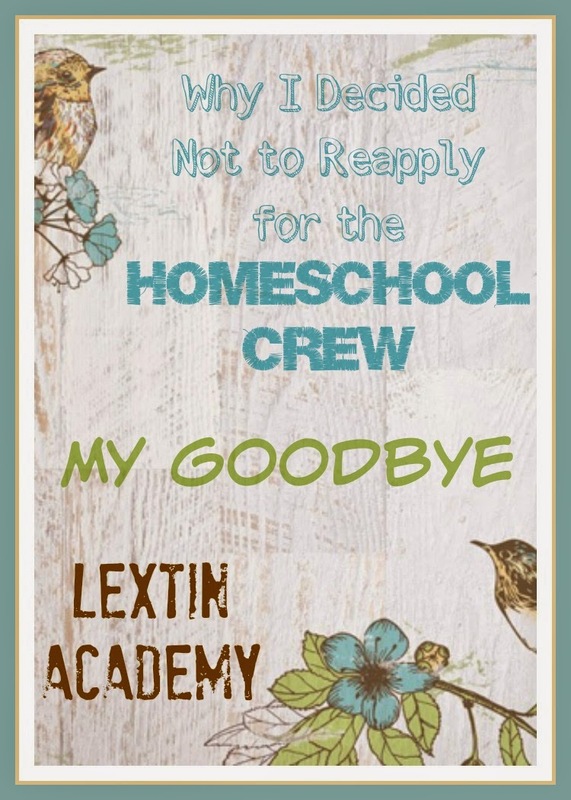 I decided not to reapply for the Homeschool Review Crew. The application for current crew members was just closed. I filled out my form to notify everyone that I won’t be back. It was an emotional decision and I’m still doubting myself at times. While I feel sad about saying no to another year with the crew, I think I’ve made the right decision for me and my family. Curriculum – Can you really argue with free curricula? I received so many wonderful products. Many of them were new to me. I felt consistently blessed to open boxes of excellent learning material. There were so many products that I would never have chosen on my own that we ended up loving. There were others that were not in the budget for our year, but that we were blessed to be able to use. Commarderie – Through being on the crew I got to connect with so many wonderful bloggers. I was a part of a wonderful blogging community of homeschool moms who were willing to share their wisdom and their tech savvy blogging tips. I was encouraged and challenged through their stories and their advice. Chatting with them on our private forum and following their blogs inspired me. Consistency – Being on the crew helped me build my blog and blog with greater consistency. I blogged because I simply had to as one of the requirements. But as I kept in touch with other bloggers, I was challenged to keep writing. I appreciated the high standards and the desire for consistent bloggers. Community – Through being a part of the crew my blog has grown exponentially. I know that I could not have done this on my own. It was only through the community of wonderful bloggers who shared blog articles on social media, consistently read my blog, and commented on my various posts that my blog felt a part of a larger community of bloggers and received greater exposure. Disruptions – While I love trying new curricula, I’ve found that our year is very, very full. Over the past few years I have found curricula that I love and that is a good fit for our family. I’m happy to stick with these programs for now. I have started to view the crew curricula as disruptions to our busy homeschool day. I’ve begun to feel stressed trying to find a way and a time to fit in the new programs. Sometimes it means that I have to put some of our regular work aside to try new things. Other times it means additional work on top of what we are already doing. I’m ready for freedom to use what we love and have no curricula interruptions in our school year (unless I deem a change necessary). Deadlines – All of the reviews have deadlines. They’ve started to stress me out and make my blogging feel like more of a chore than a delight. Some nights I am up late against a deadline. Other times, family issues come up and leave me scrambling to write a detailed review. After a long day of homeschooling and then cooking and cleaning and parenting and spending time with my hubby, I don’t want to think about deadlines. I want freedom from stressful deadlines and I want to be in control of my own schedule again. Direction – My priorities are shifting and I’m moving in a new direction. While I enjoy blogging I don’t want it to be my main focus. I feel I need to put more time and more of myself into my relationship with my husband, kids, family, and friends. I just want to be more available and have time to enjoy new opportunities as they arise. I don’t want to feel over-committed. Development – Taking a break from the crew will hopefully give me some more time for personal development. I want to spend time reading and reading and reading. I want to dive deeply into learning with my kids and take off on some learning tangents of my own. I plan to stay active and involved in Bible studies and in church activities. I might even take some online workshops or participate in some free courses to enjoy some self-education. I have plans to help at many homeschool conventions in the upcoming year and I hope to be more active and involved in my husband’s job opportunities. I simply want the time and availability to pursue my own interests and try some new things as a means of personal development. So, there you have it. That’s why I’m choosing to make some changes at Lextin. I’m looking forward to the extra time that I will fill with other pursuits. I’m also going to enjoy some social media breaks and just time to “be still” and enjoy the moments. While I loved my time on the crew and will miss everyone affiliated with the crew, my decision can be summed up in one word: simplify. My last reviews will be posted in November and then I will no longer be a crew member. I will miss the crew community but will keep up with everyone on their blogs and hope to “see” you here at Lextin. This is my goodbye from the crew but I can’t wait to see what the next year holds for all of us. Understand completely but still don't have to like it! ;). You will be missed! I can totally understand and actually had a hard decision myself. Good luck to you in your new direction and we will miss you!